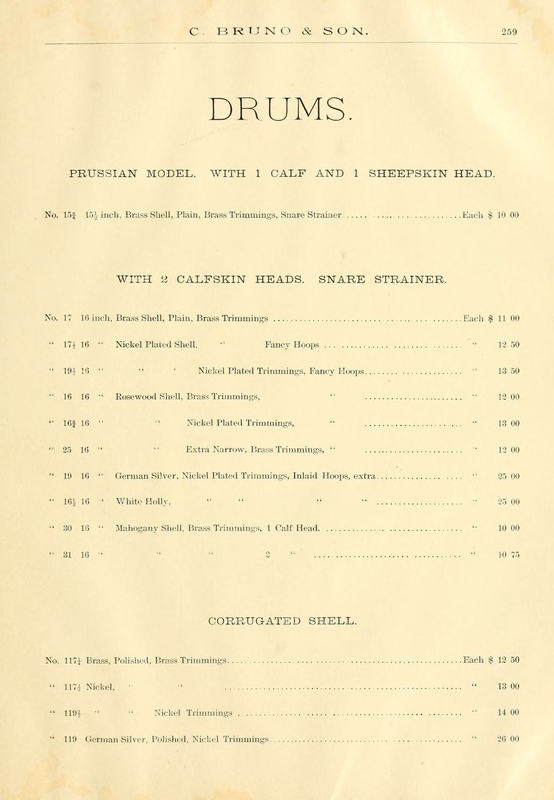 Towards the end of the 19th century, American musical instrument retailers began cataloging drums described as "Prussian" models. These were not generally instruments imported from Prussia, but rather early rod tension drums as opposed to the more traditional "regulation" style of drums which used rope and leather tugs to tune the heads. Prussia was of coarse the powerful German state which in the 1860s and 1870s had claimed a series of resounding military victories including the Seven Weeks War in 1866 against Austria, and the Franco-Prussian War in 1870 - 1871 which ultimately lead to a united Germany. 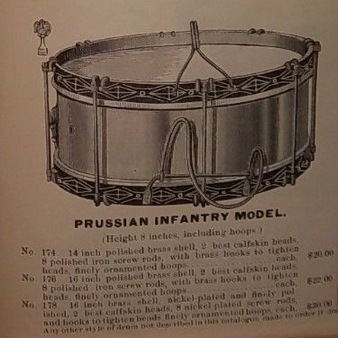 So labeling an American made instrument as "Prussian" at this time would have not only related it to the style of drums actually carried by the Prussian Army, but also would have held connotations of great strength and might. 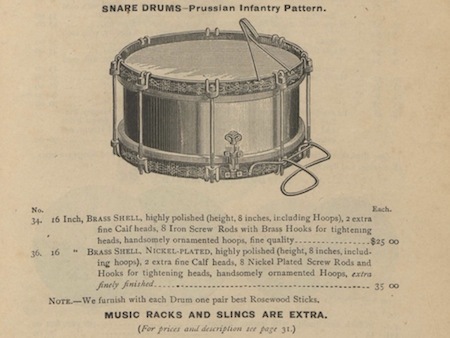 All of this being said, the most important takeaway is to know that the "Prussian" drums manufactured and sold during the 1880s and 1890s in the United States were some of the first widely produced rod tension drums. The Lyon & Healy Handbook of Musical Instruments (1896) further describes Prussian drums relative to the so called "regulation" drums of the day. The American made Prussian style drums of the late 19th century may have been progressive in their use of metal hardware, but the instruments themselves weren't necessarily high end. Many were of the mass produced variety sold through band instrument dealers and mail order catalogs. These drums were often very basic in construction with crudely riveted metal shell seams and clumsily hammered snare beds. The metal hardware used to tension the drum was functional but typically rough and bulky. Labels applied inside Prussian drum shells usually list the retailer who sold the drum, but not necessarily the maker. Identical drums exist bearing differing labels thus the true origin of many drums is ambiguous. Shared catalog artwork between advertisers leaves the matter of determining a specific manufacturer even more dubious. 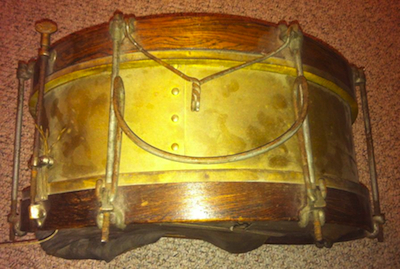 Prussian drums were sold by a vast number of music houses including John C. Church (Cincinnati), Oliver Ditson (Boston/New York), Lyon & Healy (Chicago), Thompson & Odell (Boston), J. W. Pepper (Philadelphia), Whaley & Royce (Toronto), John C. Haynes & Co. (Boston), the Rudolph Wurlitzer Company (Cincinnati), C. Bruno & Son (New York), Julius Bauer & Company (Chicago), and William Tonk & Bros (New York). 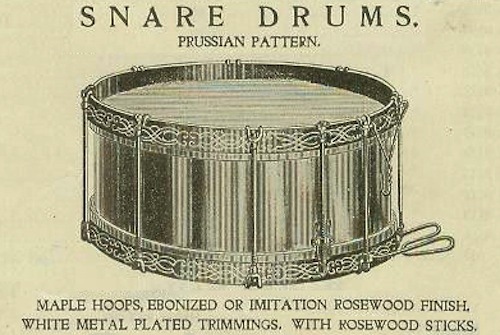 Even mail order companies such Sears Roebuck & Company cataloged Prussian drums among their selection of musical instruments. Based on the prevalence of surviving examples, metal shells appear to have been most popular. This in and of itself was a significant evolution as American made drums to this point had traditionally been formed from wood. Nickel, German silver, and brass shells were common for Prussian drums. Wooden shell Prussian drums are not uncommon however. Drums constructed around maple, white holly, or rosewood shells are typically offered alongside metal shell models in advertisements. Hoops were normally wooden, often painted black or stained in a faux rosewood finish. Gilded and more ornately decorated hoops were also offered in many catalogs. Tensioning hardware was comprised of multiple sets of large square headed tension rods passing through claws clasping each hoop. The rods passed loosely through the claws holding the top hoop and threaded into claws grasping the bottom hoop. This was an efficient way to tighten or loosen both heads at the same time but lacked the ability to tune the heads independently. Prussian models were often equipped with leg rests making it easier to play the drum while standing or marching. The leg rests commonly were connected to the metal drum claws. Snare strainers were simple allowing for the tightening and loosening of gut snares. 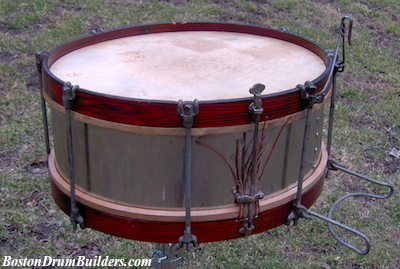 From these early rod tension snare drums, the modern snare drum would eventually evolve. As Prussian drums were smaller than regulation rope drums, "orchestra" models were more shallow than Prussian drums. 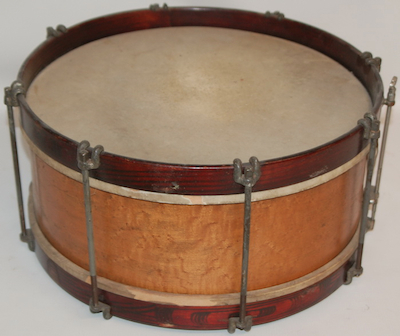 Similar tensioning methods to those used on Prussian drums would soon be scaled down and refined giving rise to the more modern instruments of the early 20th century.